The key to land investment success is to do extensive research to determine the right time to acquire a property. Tomlin has the ability to envision the most profitable future land use, then obtain proper zoning and plan for utilities to maximize value. Continuing market research and analysis allows Tomlin to market the product for sale or development, at the optimal time to maximize profits. All Businesses need a philosophy. Making money is not a philosophy. colleagues, investors, employees, family and God. If you focus only on today, only what is hot, you lose sight of these long term goals. Those who only look to today take short cuts and pay the price later. Projects range greatly in size and scope because Tomlin’s goal is to maximize returns and not simply take on a large number of projects. Tomlin’s continued success since 1970 has been driven by utilizing a four-step process. Tomlin’s leadership is paramount to continued success. The Dallas area has always grown or developed primarily to the North because this is the area that produces most of the new jobs and has the infrastructure of roads, sewer and water that supports new growth. We believe this northern growth will continue. The extension growth to the north will be more focused along Interstate Highway 35, The Dallas North Tollway and US Highway 75 (Central Expressway). The land west of Interstate 35 is primarily covered by natural gas wells and gas pipelines thereby restricting growth in that direction. The land east of US Highway 75 has limited road access and lacks water and sewer facilities to adequate serve typical development. We see the majority of the future growth and development in the Dallas area continuing to extend north of Dallas between Interstate Highway 35 and US Highway 75. The Growth Map shows North Texas land development by decade. 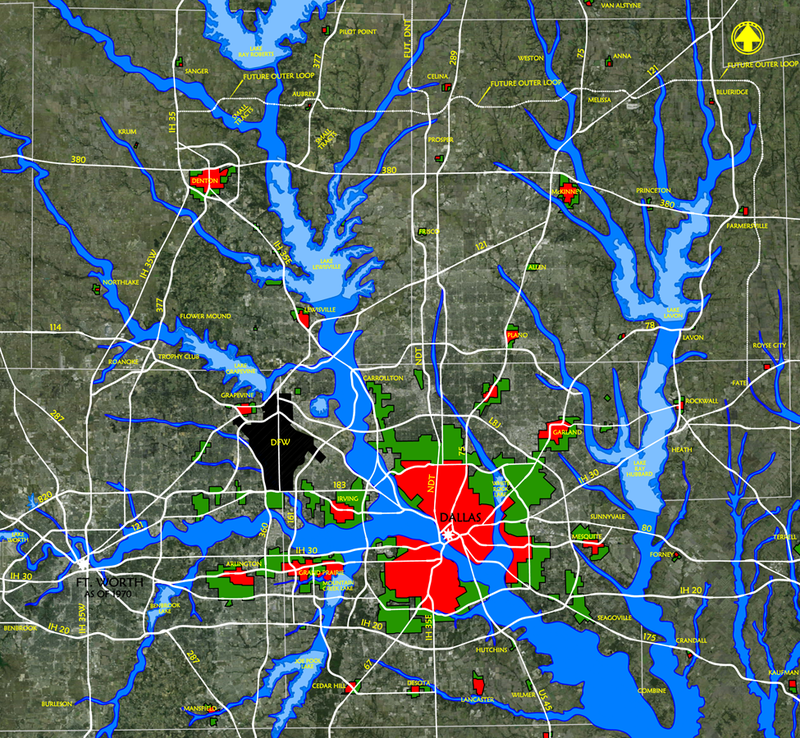 The study begins with the year 1950 in the Dallas area and 1970 in the Ft. Worth area. Land developed by the end of 1950 is represented in red. Then each following decade is represented by a different color as shown at the bottom of the map to the end of 2010 in yellow. Choose decade to see growth. 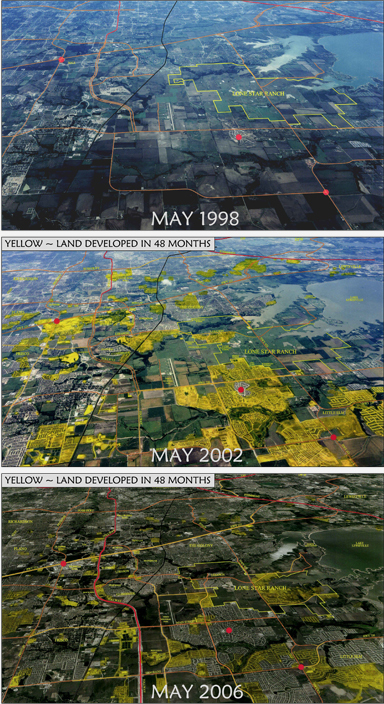 From May, 1998 through today, land development in North Texas has exceeded all expectations. Despite periodic interruptions due to economic turndowns, land development has coincided with northward extensions of the Dallas North Tollway. Starting in 1998 from the intersection of the Tollway and U.S. 121 (the Sam Rayburn Tollway), the North Texas Tollway Authority (NTTA) put in north and southbound service roads to Main Street in Frisco. In 2002, the northbound service road was extended to El Dorado Parkway in Frisco, followed by the southbound service road. In 2004, the Tollway itself was extended to Gaylord Parkway/Main Street, and the extension north to U.S. 380 was completed in 2007. The northward push continues unabated. The north-bound service road has been extended to C.R. 428. This service road should be extended north to the Grayson County Line. The next proposed extension of the main lanes of the Dallas North Tollway will extend the Tollway another 17.6 miles from U.S. 380 to nearly five miles north of the Collin/Grayson Country line. Copyright © 2014 Tomlin Investment. All Rights Reserved.